DGB has launched a range of authentic Spanish Sherry range sourced from leading producer Caballero and sold under the Douglas Green label consisting of a Pale Cream, Medium Dry and Cream Sherry, the wines designated No.1, No.2 and No. 3, according to time in barrel and hence colour. All perfectly drinkable, they have a recommended retail price of R130 a bottle. I’ll take a bet that the colour is due to less natural effects than time in barrel (do you mean oxidation or colour from the wood, Christian, or didn’t they tell you that?). What a pity that they didn’t bring in at least one sherry that is not sweetened. It looks like these are to replace the Douglas Green locally-produced stuff, which were also labelled No 1, No 2, No 3. Did they tell you why they’ve stopped making their own? BTW, I presume the producer is in fact Lustau, not Caballero, which is the company that owns Lustau. Hi Tim. Thank you for your interest shown in our exciting new Fully Imported Sherries. 1)	We are considering bringing in a Fino, but want to review the performance and acceptance of this range first. We do however expect the SA market for Fino to be very small indeed, and therefore decided to start with a range that better suited the majority of SA Sherry palates first and to extend the range in time towards more refined tastes. 2)	Douglas Green stopped sourcing Fortified wine in South Africa due to quality and consistency issues. We therefore decided that rather than produce or source locally, that we would rather do so directly from Spain, in order to ensure authenticity and consistent quality to accompany the Sherry name. 3)	Grupo de Cabellero was established in 1830 and owns a number of cellars/bodegas in the Sherry Triangle. They own the Lustau brand however also own a Bodega in each of the three important cities in the Jerez region , el Puerto de Santa Maria, Jerez de Fontera and in Sanlucar de Barrameda. I hope that this answers your questions satisfactorily? Should you require any further info, please don’t hesitate to contact us directly. 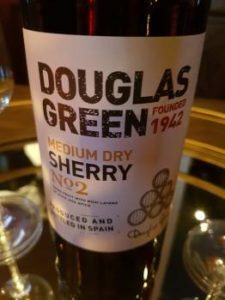 Douglas Green Pale Cream Sherry: is made from Palomino grapes and starts life as a Fino , aged under flor, Grape-must is then added to the Pale sherry for the classification Pale Cream, hence the pleasing sweetness. Oxidation in barrel is however not encouraged. Douglas Green Cream Sherry: is a blend of dry Oloroso aged in oak and sweet sun-dried Pedro Ximénez (after harvest and before vinification). For Oloroso, flor development is discouraged with fortification at an early age and the wine matures in this oxidative style in the barrel sometimes for years as the colour deepens to a dark brown.